So how do virtual elementary teachers prepare for a new crop of eager learners? Luckily, for all the new teachers just starting this adventure, the blueprint is surprisingly similar to a brick-and-mortar school. The 2016-17 year kicked off this past week by building community. Here at FLVS, we begin by making our Welcome Calls, the official phone call where we share what our program has to offer, go over expectations, answer questions, etc. But more importantly, we begin to know our parents, all home educators. Many, like my newest colleagues, are also taking this on for the first time. We seize the opportunity to speak with our students…find out what kind of books they like, what they like to do when they’re not doing schoolwork, and sometimes we get to hear what they want out of this school year. I laugh when I hear people talk about groupies — defined by most as people who follow a celebrity in hopes of meeting them. I felt like I might get that label several years ago, because I would look for Shelley Harwayne in the program of any literacy conference and make sure to attend her session, front and center, if possible. At the time, she was director of the Manhattan New School and shared that their 500 students represented 35 cultures and almost that many different languages. This circles back to building community. Ralph Peterson refers to community as “Making a Caring Place.” How do we do that in the virtual classroom? How do we do this with our colleagues? Going back to the puzzled looks and questions about setting up and arranging a classroom (and maybe because I’ve been lesson planning for third grade with a heavy emphasis on map work in social studies) makes me think of geography and my favorite beginning-of-the-year thoughts on the importance of setting up the classroom. In brick-and-mortar schools, this means everything from arranging the furniture to making sure the spaces match the different learning approaches you want to incorporate. But those thoughts are old thoughts, ones I had before I started teaching with FLVS. Now I see that designing classroom space is part of all blueprints. At FLVS, it’s creating slides with standards-based content that is also interactive and engaging. It’s getting the most out of Class Time when we greet children with a brain warm-up in our virtual classrooms. It’s keeping them on their toes by effectively interacting with different tools as we explore the content. 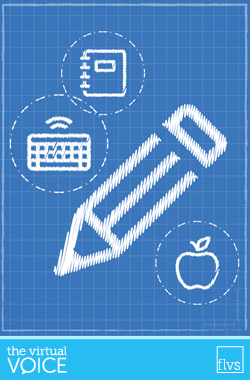 This entry was posted in Educator Edition, Parent Edition and tagged Back to School, Collaboration, Community, Elementary, Elementary Teachers, FLVS Elementary, FLVS Flex, FLVS Flex Elementary, Planning, School Community, Student engagement, Teacher Communication, Virtual Classrooms, Virtual Learning on August 11, 2016 by Guest Blogger.